Google has now become a bigger player in mobile advertising as the FTC has approved the Mountain View based company's acquisition of AdMob. The bottom line is that Google will be able to offer more choices for advertisers seeking mobile exposure for a product or a brand. The deal, announced by Google on November 9th, brings the latter's expertise in delivering mobile ads and the technology necessary to make sure they reach the proper targets, with AdMob's mobile publisher network. Google is paying $750 million for the company which Apple claims it was on the verge of acquiring until Google took it right out of the Cupertino based firm's mouth-at least that is the Apple version of things. Steve Jobs bought Quattro Wireless as a substitute and added the iAd platform to the new iPhone OS 4.0, events that might have persuaded the FTC to green light the AdMob deal. 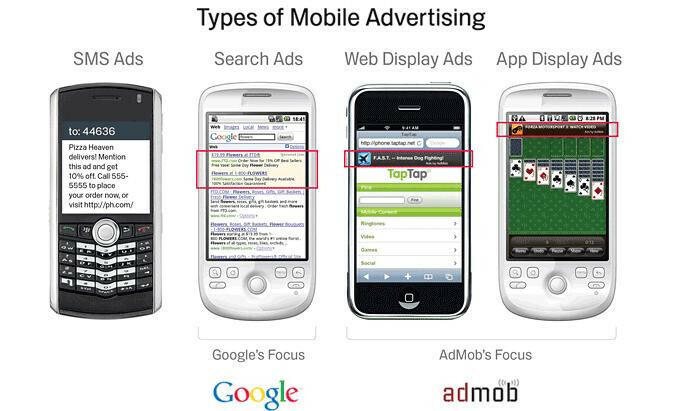 With Apple in the mobile advertising arena, a Google-AdMob combination does not control the entire platform. After Google's successful bid, the company had fears that the FTC would find it to be anti-competitive, but now that this hurdle has been jumped, all that remains is the closing and the inclusion of AdMob's operations into Google's mobile advertising network. After that, we should see a battle between Google and Apple for control of the mobile ad market. Because it's a company chock full of hypocrites! And, as of late, underhanded business practices. But I guess that depends on which side of the glass you are standing. Anyway, I absolutely respect the iPhone and all it's done for the mobile industry because, honestly, without it we wouldn't have sooo many awesome products out there now. Or would we? Google was well on its way to creating Android 2 years before crApple released the iPhone (look it up, "Google buys Android Inc"). Anyway, I disagree with the idea of paying a premium for a mediocre product that looks and feels.....pretty. I'm smart enough to customize a machine of my own. I know some people aren't or don't care too, and thats fine, but it's still my opinion. I don't like crApple cornering developers into the "walled garden" that is the app store, going so far as mandating the apps are created on a Mac....really? I don't like the fact that since (blow)Jobs has started a war with Adobe that everybody and their mother has been bashing Flash when you didn't hear a peep about it before he opened his mouth. I don't like crApple having the police bash down a journalists door because of a prototype that was RETURNED TO THEM! And to top it off send their secret police to the guy who found it asking to search his house....wtf really? It's not that serious! There's plenty more I could go into but won't because this is long as is. So why don't you like Google? Yea, they collect a lot of imformation, but from what i've seen they use it for good things. Don't wet your pants just yet over your fantasy Apple Demise just yet....lol Remember....everybody said the same thing concerning Microsoft .vs Apple. Oh! Apple is dead! Microsoft is going to kill it off! BLAH....BLAH...BLAH If Apple could survive to do very nicely for itself, it can certainly survive anything Google can slop up there. Jobs is a shrewd cookie and he has a lot of shrewd cookies working for him. They are not about to give anything up that is of real crucial value and worth to the future of Apple. I'm not an Apple advocate, in fact I've never owned one single Apple product, but I have to laugh at those of you who are constantly crying over Apples popularity in this free market that we all love and admire. A popularity that in my opinion doesn't look like it's going to fade anytime soon. Google up and get over it! All I can say whatever products I have bought from Apple they have proved to be solid and that's what the company does, I don't think too many people can dispute that argument. Their products are highly innovative and I believe they will continue to so loosing any ground as things are equal today I don't think that will be the case whether it's Google, Microsoft, HTC or whatever. Every company has a niche product and consumers are free to choose from a huge variety. I personally use both PCs and MACs and both have their advantages and disadvantages, simple.